Overseas investors are eyeing off Bangkok for further development according to Chris Hobden of Savills Thailand. 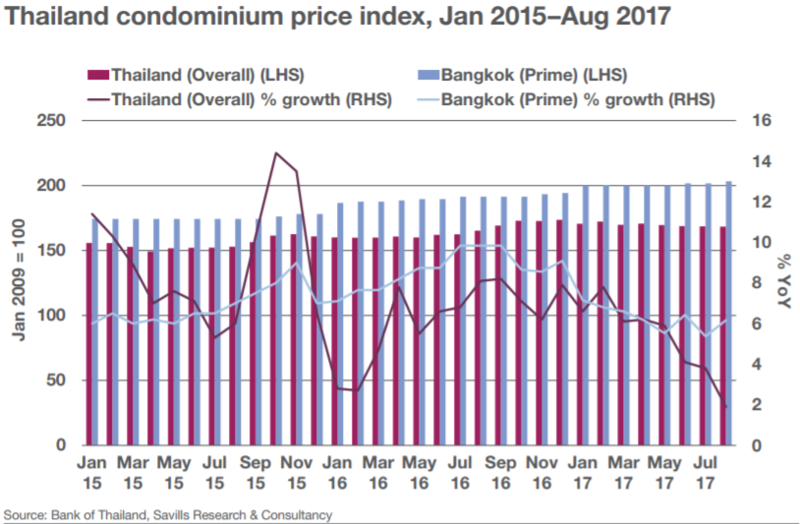 Savills' latest report shows record luxury residential prices continued to draw investment over Q3 2017, with developers showing sustained interest in prime Bangkok land sites and condominium projects. Despite an overall subdued economy, Foreign Direct Investment (FDI) in real estate increased by 29% year-on-year over 1H/2017, reaching a total of US$1.1 billion. Listed property developer Supalai PLC acquired the former Australian Embassy for THB4.6 billion (USD138.76 million), with plans to develop a scheme comprising luxury residences and Grade A office space. The sale follows a trend of western embassies selling off prime Bangkok CBD sites, with the UK and France having sold parcels to developers in 2007 and 2011 respectively. Cautious domestic bank lending, coupled with growing overseas interest in Thai real estate, led to further joint ventures between prominent Thai developers and foreign partners. SET-listed All Inspire Development PLC announced a Joint Venture with Japan’s Hoosiers Holdings to develop a 772-unit condominium scheme, with Sansiri PLC disclosing details of a second venture with Tokyu Corporation, following their first joint condominium project due to launch later this year. Origin Property PLC forged a joint venture with Japanese developer Nomura Real Estate Development Co, releasing details of four new condominium projects reportedly worth a combined THB8.6 billion (US$259 million). Property Perfect sold its entire 65% stake in Dara Harbour to commercial developer Central Pattana for THB291.75 million (US$8.6 million), as Property Perfect repositions to focus on residential development moving forward. Outside of Bangkok, CP Land PLC, the property arm of Charoen Pokphand Group, acquired a 400 key, non-performing hotel in Chiang Rai, with plans to relaunch in Q1/2018. wider S&P Emerging REIT index by 4.6ppt. Ticon Industrial Connection PLC released plans to convert three of its property funds into the country’s single largest REIT, due to comprise total assets of THB32 billion (US$964 million).